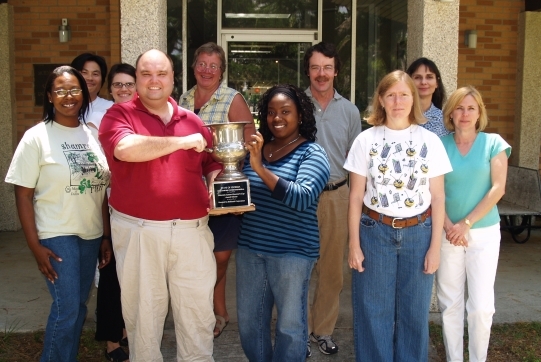 Our employees won the award for the third year in a row and the 8th year out of the last 12 for state agencies with between 1-100 employees. In the five years we didn’t win it, we were runners-up. I always knew we had a great group of people here, but it’s nice to see the recognition all the same. In the photo, (l-r) Tina Walters, Sang-Man Cho, Megan Peck, Jay Bandes, Julie Amft, LaGina Frazier, Jim Nelson, Anna Boyette and Christel Morrison. Biofuel from algae has re-emerged in the news as a promising alternative to traditional sources of energy. Many experts believe that algae will eventually surpass all other biofuel feedstocks as the cheapest and most environmentally-friendly way to produce liquid fuel. Corn is currently the only commercially-viable source of ethanol fuel production, but it is an environmentally-taxing process. Growing demand for corn due to the expansion of ethanol has increased concerns that environmentally sensitive lands will return to production. These lands have the potential for environmental damage if they are farmed. In addition, the use of corn for ethanol greatly reduces its availability for food products, thus generating higher food prices for consumers. There are other, more environmentally-friendly ways of producing ethanol. Much of the ethanol industry is focused on the potential of converting cellulose to ethanol. This includes materials such as corn stalks, wheat straw, grasses, trees, etc. Cellulose ethanol production would allow farmers to harvest perennials appropriate for their area, rather than forcing corn onto lands that are not well-suited to support it. The energy bill signed into law last year requires that 44 percent of ethanol be derived from cellulose by 2022. Production of cellulose ethanol, however, is still at an experimental stage and faces a number of challenges. Ultimately, however, if researchers can streamline the process, then ethanol could be made from a variety of plant materials. The notion of using vegetable oil for fuel has been around as long as the diesel engine. The main source of food oil based biodiesel is the soybean, but unless soybean oil prices decline dramatically, biodiesel cannot be produced in large quantities at a cost that is competitive with petroleum diesel. Algae, on the other hand, can be used to produce biodiesel fuel and has a potential energy yield many times higher than that of soybeans. An average acre of algae grown today for pharmaceutical industries can produce 5,000 gallons of biodiesel each year. Algae need only sunlight, water, nutrients, and carbon dioxide to grow, have extremely fast growth rates, and some types of algae comprise 50 percent oil. It should not come as a surprise, then, that algae is being viewed by some as an attractive alternative to vegetable crops for energy production. In fact, this knowledge is nothing new. The US Department of Energy began investigating algae in the 1970s. The Aquatic Species Program, as it was called, grew algae in open pond test sites in Hawaii, California and New Mexico. Although the project achieved maximum yields of more than one hundred times that of oil palm (oil palm is among the most efficient of conventional crops) the program was abandoned in 1996 because the low cost of crude oil made it difficult for alternative fuels to compete and because of inadequate knowledge of the biology involved in alternative fuel production. As oil and food prices recently began to increase, small algal fuel producers have arisen. Nevertheless, algae still has not been proved as an economic proposition. The challenge is coming up with economical systems. The algae-to-biofuels community is mainly focused today on super strains cultivated in bioreactors (vessels in which biochemical processes are carried out). Using this technology, commercially-viable production of biofuels is still years away. This may be true when it comes to the use of bioreactors, but some experts claim that open-pond systems are commercially viable now and that these systems may be the only hope for keeping capital costs low enough for algae-to-biofuel technology to be commercially viable in the future. An economic environment that can support low production costs, research expertise in marine algae, and in the conversion to a useful energy product, may all be key to the development of a commercially-viable algae-to-energy enterprise which would give us an abundance of local low-cost fuel. 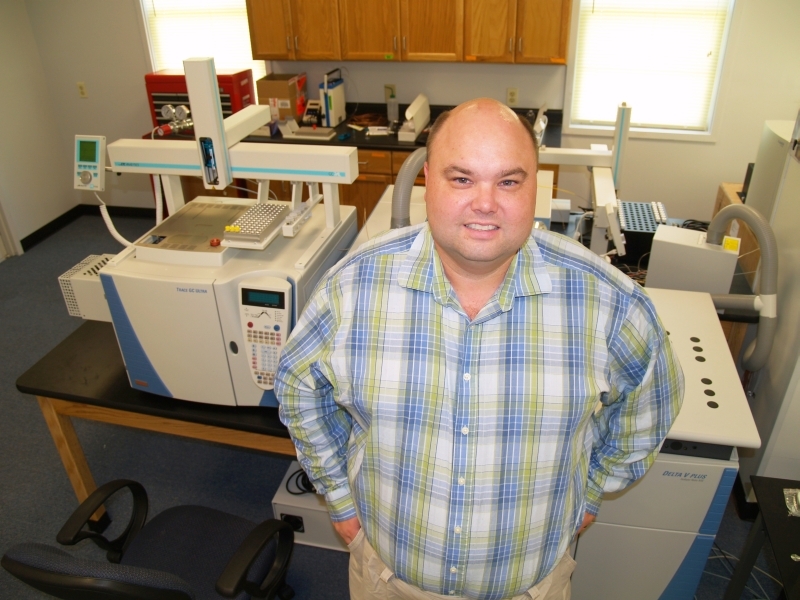 One of our professor, Jay Brandes, just had an article published in the journal “Science.” That is one of the “big ones.” Here is the full information, as we sent it out to the news media. 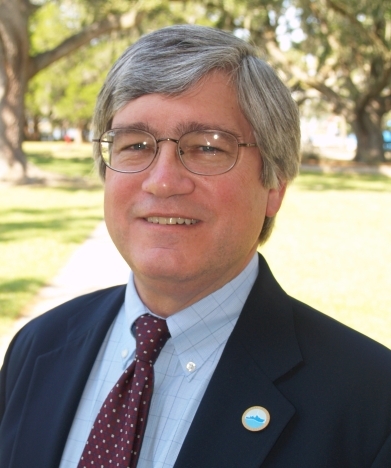 Skidaway Institute of Oceanography professor Jay Brandes is the co-author of a scientific article published in the May 2, 2008 issue of the prestigious journal Science. Brandes worked with Georgia Institute of Technology researcher Ellery Ingall and his Ph.D. student Julia Diaz, as well as with physicists at the Argonne National Laboratory. Using state of the art X-ray microscopes capable of chemical imaging within cells, the team discovered a new mechanism for the removal of the vital nutrient phosphorus from the marine ecosystem. Diatoms, an abundant microscopic plant found in the oceans, were found to produce concentrated polymeric phosphorus particles only a few millionths of an inch across. After the diatoms die, these particles “seed” underlying sediments with the precursors needed to form long-lasting calcium phosphate minerals. Their findings explain a long-standing, fundamental mystery regarding the way phosphorus is cycled through marine systems. Phosphorus is a vital nutrient element required by all organisms. In addition to being a key nutrient, phosphorus is also an important pollutant which, when discharged, is often the primary cause of low oxygen levels in lakes, rivers and coastal waters. Because of this, understanding the cycling and sequestration of phosphorus is also important to water treatment and mariculture systems which can produce large quantities of phosphorus enriched waste. (AAAS), the world’s largest general scientific organization. This work was funded through a grant to Brandes and Ingall by the National Science Foundation. One of our scientists, Dana Savidge, recently received a $180,000 grant from the Georgia Research Alliance to continue with the development of a coastal radar system. This high frequency radar system is built around two transmit-receive stations, one in South Carolina and the other on a coastal island south of Savannah, and is designed to monitor surface ocean currents on the Georgia continental shelf. It has a coverage area that runs roughly 125 miles north to south and extens out over 100 miles. 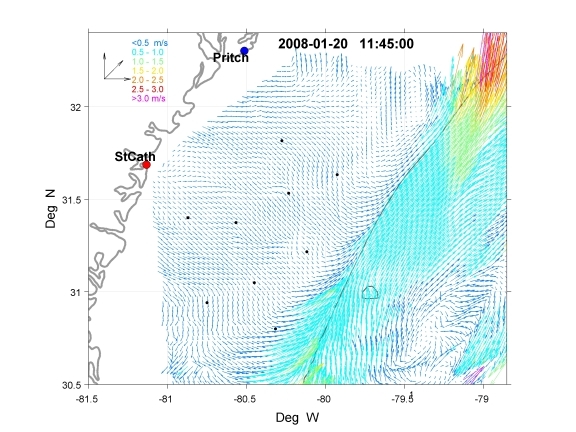 It can “see” the Gulf Stream, which flows north along the edge of the shelf. It works by focusing on a particular size wave. With the two transmit-receive stations, it can detect and measure the speed and direction of the surface waves. Since the speed a particular size wave moves over still water is known, that factor can be subtracted out and you end up with the speed and direction of the actual water. 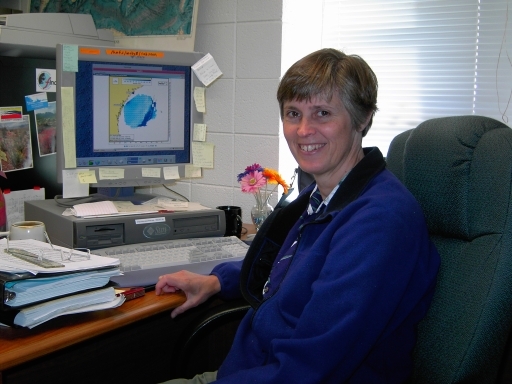 Dr. Savidge’s primary interest is researching the way water moves around on the shelf, inshore of a boundar current (Gulf Stream). However, once fully operational and calibrated, the system can also have some practical applications, like search-and-rescue and chemical spills. For information, check out our Web site.